AWS provides a lot of features and services for writing serverless architectures with Python. 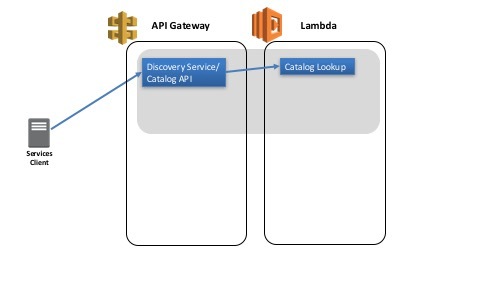 In this four-part series, we will show how you can use Python to manage and implement Amazon API Gateway, AWS Lambda, and Amazon DynamoDB. We will use a common use case, service discovery, to showcase a simple way to do this with Python and boto3. Service discovery is a foundational service for microservices. There are many implementations running on servers or in containers, including Consul by HashiCorp and ZooKeeper from Apache. Then we will be able to use a client that can look up a Hello World service in the discovery service, and call the Hello World service. We will also implement a registrar agent with the Hello World service that will keep the information about the Hello World service up-to-date in the discovery service. 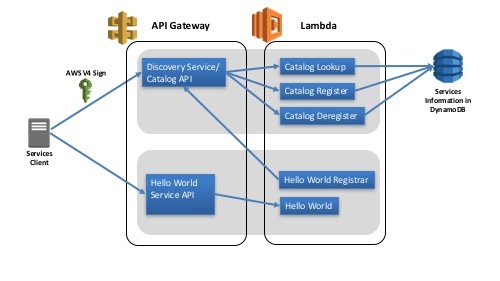 We will create the basics of setting up a service running on API Gateway and Lambda. So we can do something easy to get us started, for this first step, we will return hard-coded values in the service. """Add directory to zip file. :param path: The top level path to traverse to discover files to add. :param ziph: A handle to a zip file to add files to. """Create a deployment package for Lambda. :param package_name: The name of the package. Full or relative path. :param file_names: Files or folders to add to the package. """Create a Lambda function from zip-file. :param function_name: The name of the Lambda function to create. :param handler: The handler to execute when the Lambda function is called. :param description: The description of the Lambda function. :return: The ARN for the Lambda function. We read the package into memory and provide it directly to the create_function method that creates our Lambda function. You might want to put a large package in Amazon S3 and then submit a reference to the package. We need to give permissions to API Gateway to call our Lambda function. We do that using the AWS Lambda resource policies, adding the ARN of the API Gateway service for our account to the Lambda permissions. We again start with a couple of utility methods. """Replace string occurence in file. :param filename_source: The name of the file to read in. :param filename_target: The name of the file to write to. :param old: The string to find in the file. :param new: The string to replace any found occurrences with. """Get Rest API Name from Swagger file. :param swagger_file: The name of the swagger file. Full or relative path. :return: The name of the API defined in the Swagger file. The replace_instances_in_file function allows us to take Lambda function ARNs and put them into specific places in the Swagger file. We will put in a marker string in the Swagger file. This function finds the marker and replaces it with the Lambda ARN. The get_rest_api_name function allows us to get the name of the REST API specified in the Swagger file so we can use it with calls to the API Gateway API. """Create an API defined in Swagger. :param swagger_file_name: The name of the swagger file. :return: The id of the REST API. Like the creation of the Lambda function, we read the Swagger file into memory and submit it directly to the function. """Deploy API to the given stage. :param api_id: The id of the API. :param stage: The name of the stage to deploy to. :return: Tuple of Rest API ID, stage and Enpoint URL. """Lambda hander for service lookup.""" The endpoint URL from which the service can be accessed. The time to live (TTL) for this information so that a client knows for how long to cache this information and can avoid unnecessary calls to the service. The status of the service, either healthy or unhealthy. We define our service method as a GET method that will take the service name and service version as part of the path. We have also defined a response model (CatalogServiceModel) that specifies our return properties as the endpoint URL, the TTL, and the status. The x-amazon-apigateway-integration element specifies how Amazon API Gateway will be integrated with AWS Lambda. The marker $catalog_serviceARN$ will be replaced with the AWS Lambda function ARN when this service is deployed.